A few years ago, Dean Rader, a professor of English at the University of San Francisco, worked on a project to find out history’s 10 best poets. With the help of feedback from the readers through e-mails, he put the Latin American poet Pablo Neruda at number one, followed by William Shakespeare and Dante. Just one poet from the East could make it to the list and it was none other than Rumi. When we have a look at Urdu poetry we feel that, at least in the 20th century, no poets have more passionately and thoroughly spoken for their people than Allama Iqbal and Faiz Ahmed Faiz. Akber Allahabadi is, perhaps, a runner-up. While Ghalib and Iqbal are two of our poets on whom a large number of books and articles have been written and the body of literature written on these two poets may constitute a small library unto itself, the material on Faiz Ahmed Faiz (1911-1984), too, has grown into quite a sizeable one since his death 31 years ago. It is estimated that on Faiz’s life and works over 100 articles, about 60 dissertations and about 100 books have been written in Urdu, and this excludes the articles included in different books or collections of essays. At least 30 Urdu magazines have brought out either special issues or special sections on Faiz. Urdu and English-language newspapers have published a large number of news items, poems, editorials and articles on Faiz. Poems, letters and prose works of Faiz himself that appeared in different publications is yet another domain to look into. A large number of articles and books have been written on Faiz in Sindhi and English, too. As a sign of our times, at least eight websites are dedicated to Faiz and his works. Sifting through all this mountain of materials and finding something one is looking for must be a herculean task. Especially the researchers, scholars and students working on Faiz or common readers willing to read some specific pieces on the bard find it frustratingly cumbersome to locate the desired work. In such situations, indexes, companions, catalogues and bibliographical works come in handy. On Iqbal and Ghalib we have such works in Urdu. But until recently we did not have any such detailed reference work on Faiz, one of Urdu’s greatest poets. But with the publication of Faiz huwe hain mar ke amar: tareekhi-o-kitabyati jaiza, a bibliographical survey meticulously prepared on the principles of Library and Information Science, has made it much easier for all of us. Arranged in alphabetical order, there are three sections in this exhaustive work: a detailed chronology of Faiz’s life with reference to authentic works; poetical, critical and other prose works of Faiz; and the sources on the life and works of Faiz. 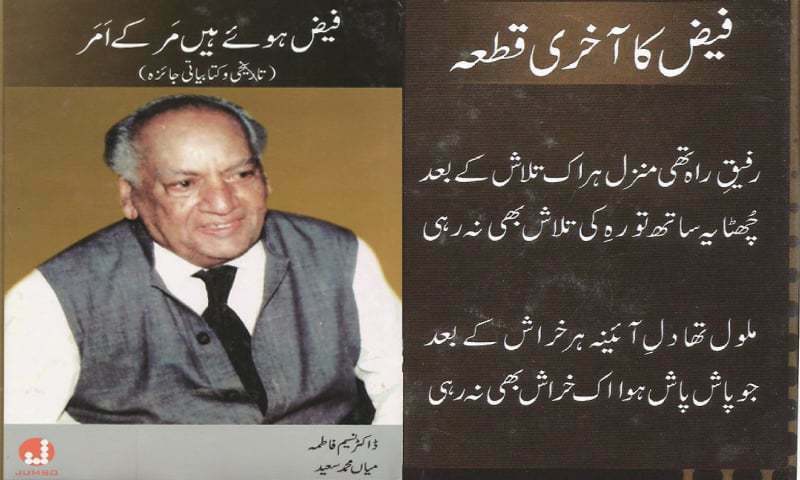 Published by Karachi’s Jumbo Publishing and compiled and edited jointly by Prof Dr Nasim Fatima and Mian Muhammad Saeed, the 418-page book is a treasure trove of information on Faiz’s life, his works and whatever has so far been written on Faiz in Urdu and English. Besides, it has enlisted books on Faiz written in Sindhi. Another section, which does not seem to go with the theme and mood of the book, is a selection of Faiz’s poetry. “Unless one reads whatever is written on Faiz,” says Jameel Jalibi in his preface to the book, “one cannot determine the stature and standing of Faiz in Urdu poetry… And in research, review of the literature published previously is very important. Keeping this in view, this book was compiled.” Prof Dr Moinuddin Aqeel has briefly surveyed in his intro to the book the tradition of such reference works as bibliographies, indices, gazetteers and biographical dictionaries. He has traced the tradition in Urdu and has mentioned such works previously published by some of our institutions such as Muqtadira Qaumi Zaban, National Book Council and Maghribi Pakistan Urdu Academy. He is all praise for the present work and its compilers. In their foreword to the book the compilers have expressed their views on the issues related to the bibliographical works. According to them, their present work is a “biographical bibliography” and is compiled “author-wise”. They feel that whatever little bibliographical aids so far published in Urdu on Faiz are not compiled on a scientific basis. They say they have kept in line with the rules laid down for modern scientific bibliographical works. But some minor errors, perhaps a result of careless proofreading, have crept in and should have been mentioned in erratum as bibliographical works must be error-free. For example, in the section describing Faiz’s life in chronological order, under the heading “1984, Nov. 18” is erroneously mentioned Faiz’s death. While the next date, that is, “1984, Nov. 20”, correctly reports that Faiz died at Lahore’s Mayo Hospital at 1:15pm (page 99). The section enlisting works by Faiz does mention his book Hamari qaumi saqafat, compiled by Mirza Zafar-ul-Hasan and published by Idara-i-Yadgar-i-Ghalib in 1976. But the second, revised edition was published by the same publisher in 2011 to coincide with Faiz centennial and, unlike other entries mentioning all subsequent editions of Faiz’s works, this information about the second edition is missing (page 132). Urdu Digest is a well-known Urdu publication and its editor, as we all know, is Altaf Hasan Qureshi, a well- known and senior journalist. But the book refers to him as Hussain and not Hasan (page 288). Prof Dr Nasim Fatima, the first Pakistani women to get a PhD in Library and Information Science (LIS), has served as chairperson of Karachi University’s LIS department. She has worked for the Sindh archives department, too. With a number of books to her credit, mostly bibliographical and biographical works, she has taken full advantage of her skills and experience in the field. The other compiler, Mian Muhammad Saeed, has been working on bibliographical and biographical sources and runs a website on the topic.